Well prepared for more rapid, continuous growth in the future-Beckhoff Automation has already been operating the Malaysia office since 2010. The cornerstone was laid at that time for rapid, continuous growth with three employees in Petaling Jaya and has been successfully driven forward by Daniel Tay as the Managing Director since 2013. Malaysia’s positive economic development has led to the establishment of Penang branch office which able to serve northern customers even better. To date, the Beckhoff team of experts in Malaysia has already been expanded to a total of 14 employees, with further personnel growth planned for the near future. This will increase the sales network in the east of Malaysia, in the states of Sarawak, Sabah and the country of Brunei. 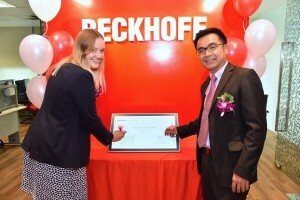 The opening of the “Client Interaction Hub” in the Petaling Jaya corporate headquarter near Kuala Lumpur in September 2017 is further proof of the continuous growth of Beckhoff Malaysia. The Hub includes a modern meeting room, and one room each specially designed for discussion and user training sessions along with a test or demo room and a lounge area. As a result, Beckhoff Malaysia offers ideal facilities for the discussion of projects and innovative solutions with customers in pleasant and comfortable surroundings. Comprehensive support services are also available for programming, system commissioning and training as well as competent, quick on-site service. In addition, customers can obtain detailed information about the latest products and solutions from Beckhoff; in the lounge area, for example, on a demo wall for TwinCAT IoT and Industrie 4.0.